The pillock we mentioned in the last story came back for another visit, don’t you know. 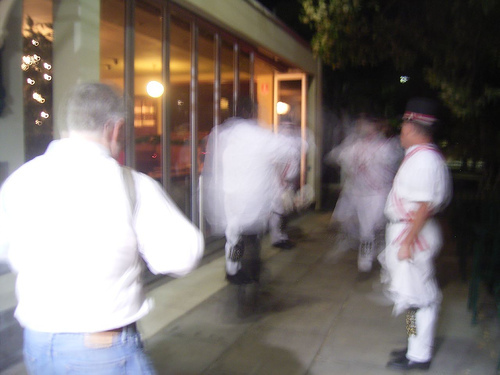 This time we branched out from tradition by dancing in front of a pub (instead of behind it). Sadly, our designated camera operator would have been designated as landfill, as none of the photos came out. Except this one, in which you can clearly tell we’re waggling our arms PARTICULARLY fast. Oh yes we are. I was impressed by the spinal tap three man jig but the speed at which the arm flapping was done flabbered my ghast. Congratulations to all participants and the makers of OMO.